Although there are several basic facial markings on horses, each marking will be unique in shape to each horse. Like snowflakes, no two are precisely the same. This is useful for horse owners because it provides a means of accurate identification. If you need to fill out registration papers, or documents like Coggins Tests, facial markings will be part of the identifying markings recorded for your horse. In the "The Black Stallion," the horse is a solid black Arabian. The role in the movie was filled by Cass Ole, a black Arabian stallion with a white star on his face. In some scenes, if you watch carefully, you can see the shadow of Cass Ole's white facial and leg markings under his stage 'make-up'. A star is a white spot on a horse's forehead, between the eyes. A faint star may only appear as a few white hairs, or the star can be large enough it covers the whole forehead area. Stars can be very symmetrical in shape, like spots or diamonds, or they may appear as irregular splotches. Some stars extend down the bridge of the nose without connecting to any other facial markings. On gray horses, the star may be very obvious when the horse is young and disappear into the graying hair coat as the horse ages. The star may blend into the coat color, but the skin beneath the coat will be lighter in color. 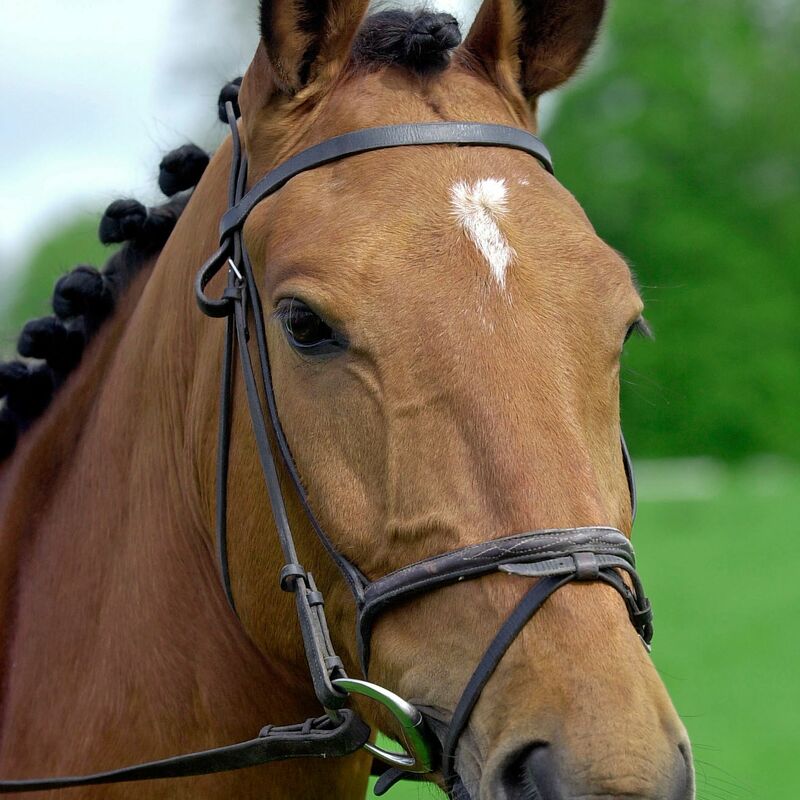 A snip is a patch of white on the horse's nose. It may be a small spot between the nostrils, or it may extend over the whole nose. A snip might be connected to a blaze or stripe. Or, a horse may have a star and a snip. A strip is a band of white that extends in a more or less even stripe down the bridge of the nose. A strip may connect to a star at the top and extend to the white markings on the horse's nose. Or they may be broken so there are three separate facial markings on the face, a star, strip and snip. The strip is quite narrow, only an inch or two wide and stays on top of the nasal bone. A strip may also be called a stripe. A blaze covers the whole bridge of the nose, from the forehead area, down to the nose. Blazes can be very symmetrical, or they can wander down the face unevenly. A blaze is much wider than the strip. The difference between a strip and a blaze is the width, as blazes cover most of the horse's face between the ridges of the bone. A bald face is covered with a much wider white marking than a blaze. The white areas extend from the forehead to the nose, and from side to side beyond the eye area to the cheekbones. The whole nose and muzzle area can be white. It's not uncommon to see bald faced horses with blue eyes. Horses with a lot of white on their noses may be more prone to sunburn. Bald faces are common in some Paint and pinto horses as well as Clydesdales. There are specific names within some breeds for types of bald faces such as apron or medicine hat. An ermine is a small colored spot within any white area on the horse's face. Ermines may appear within a star or blaze. The may be round or very asymmetrical. Ermines also appear on leg markings. It's not unusual to see a black ermine on a lighter colored horse. These ermine spots are genetic. Dark spots within the coat color are called Bend-Or spots. Combinations of these markings result in horses' unique facial markings. Typical combinations include star and strip, star and snip, and star, strip and snip. These combinations are an important way to identify individual horses. On medical records and breed registration records these identifying marks are photographed or drawn so that the horse's identity can be verified. If your horse suddenly develops white markings around the eyes these aren't likely to be permanent. White or pinkish areas may actually be a skin condition called Vitiligo. Scars too may leave white markings on a horse, but the skin beneath will not be lighter like a true marking the horse was born with.